Now no disrespect to Amanda - but I hate this colour. Its a pink. The fact that I hate pink with an unnatural and slightly absurd passion explains the not liking this polish though. (and this was purchased solely for the purpose of giving to my mother - the pink LOVER). 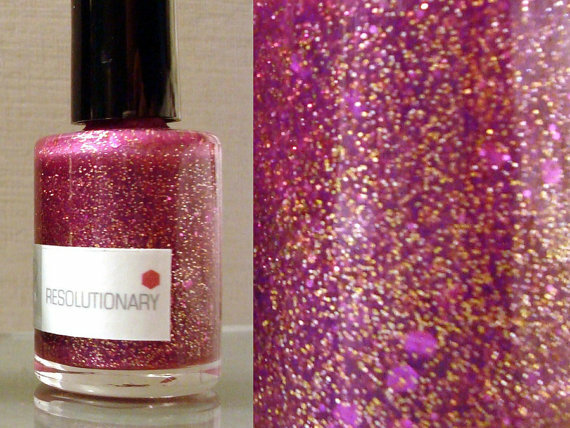 Resolutionary is described as a semi-translucent mulberry pink with fuchsia and flashing golden glitter.I am totally and completely biased and unreliable in describing and judging pinks so I will leave the description in the artists hands and leave it at that! The swatches are shown first over a crème black, then over Butter London Scoundrel, then on its own. The one on its own is two coats, the rest are one coats! This is one NerdLacquer polish I don't have (yet), but it is really beautiful! Thanks for sharing!